Super because I love SUPERMAN and my VP thought of Dynamite for me. Originally it was supposed to be CiCi Dynamite. 6. How long have you been skating? 7. How did you join derby? My co worker saw SIDR event on FB and joke to a few of us about having a SMA roller derby team…but I didn’t take it as a joke…I thought hey I want to try this boot camp out. So I signed up that same day. Funny part is I saw a commercial about roller derby few months prior to that and thought how cool is that but never looked into it. 8. What do you like most about derby? The friends I made from this experience and the adrenaline rush from playing in bouts. Minor injuries for me. During practice I bruised up my tail bone that I end up purchasing a donut pillow. Recent injury, my lips hit someone’s helmet and it got cut. I was bleeding all over the penalty box, but I continued to play until the end. End up going to the ER to get it stitched up. Constant bruises and a concussion. My first APEX JUMP during our home opener game in 2015. And my actual dream come true. I dreamt that I had bonts and I jumped the apex. I am a major Foodie person…I am a YELPER. Fav Food: Bun Bo Hue (by my mom’s only), Bo Nuong Vi (if you don’t know how to read viet…google it), Steak with yumi sides, Sashimi, Mushroom and EGGLPLANT. 13. Anyone you look up to in the derby world? I play derby but I hardly watch derby so if anyone I look up to is my A Team. Because of them, they make me work harder and be the skater that I am today. 14. Who inspires you the most from your league? 15. Who is the most challenging player you experienced? It’s never a person…it’s the solid wall that is challenging. Suburbia wall was definitely challenging to me…as as jammer there plows was on point it was hard to push them. And as a blocker, playing O was not easy. I attempted so many O’s on them, it wasn’t always succesful. 16. Do you play any other sports besides Roller derby? I grew up playing lots of different spots. But currently I play volleyball during the summer and just entry join indoor volleyball league. Would love to get into softball. 17. What personal advice would you give young derby beginners? Once your coach tells you, you’re bout eligible…you should start signing up for open scrimmage, boot camps and derby con (sign up for all the derbs). Get your foot out and experience with other skaters outside your league. You’ll gain so much knowledge and skills when you do that. That’s what I did. 18. When and what occasion was a specific moment you felt like you really had to push yourself even harder? 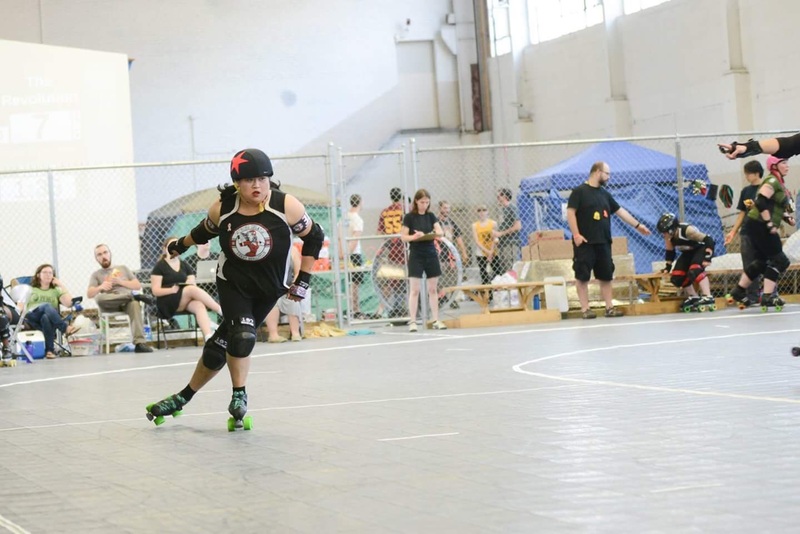 As a jammer…you get really tired…if you don’t have a lot of endurance you just have to keep going and push through that wall any way possible. This is the toughest situation I have to deal with and still do. Working on it tho. 19. Hobbies outside of derby: I am a HUGE FOODIE person. I enjoy to eat all the foods and attend yelp events. Arts and Crafts…I crochet for HOOKS AND HIPCHECKS Crochet. Check us out. I also, make my own cards and make other things that I think I am capable of doing. I doodle here and there…love graffiti so I newb tag.